It looks like economic growth will pickup over the next few years. I’ve written about this before – a combination of growth in the key housing sector, a significant amount of household deleveraging behind us, the end of the drag from state and local government layoffs (four years of austerity nearing the end), some loosening of household credit, and the Fed staying accommodative (with a 7.8% unemployment rate and inflation below the Fed’s target, the Fed will remain accommodative). While there has been recovery in metrics like industrial production, durable goods orders and GDP, the (artificially stimulated) euphoria in markets is probably strange news to consumers and workers and businesses and job seekers in the real economy. All the various measures of unemployment remain weak especially the employment-population ratio which is still deeply depressed. Private-sector debt remains dangerously high. 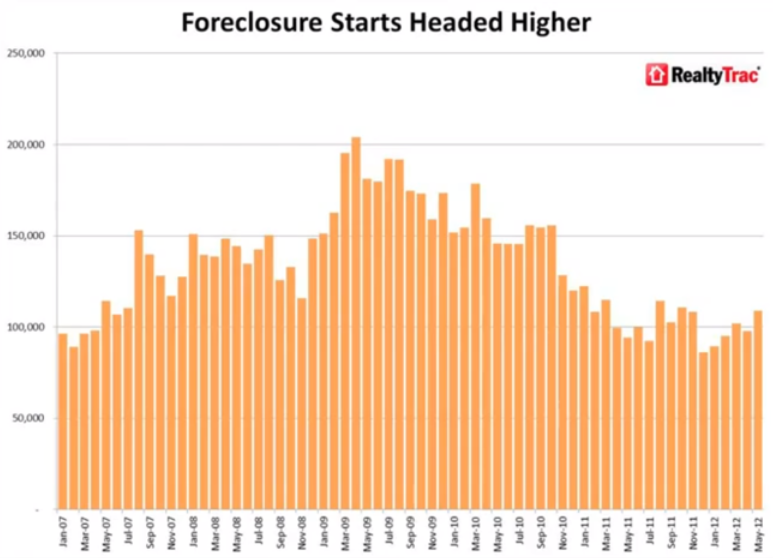 Home prices are still depressed and foreclosures remain high. Consumer sentiment remains depressed. The financial sector continues to blunder from disaster to disaster. And there are lots of big geopolitical dangers still on the table — not least Japan-China and Iran-Israel. This implies that the market has become dangerously euphoric, and that risk is being improperly priced. We caution our readers about past periods of deflated volatility; the last time the VIX traded down to a new low, which occurred on 01/24/07, it rallied drastically in the following month. Approximately six weeks later on 03/05/07 the index had increased to 98.48%. By 08/16/07, less than eight months from the low, the VIX index was up 211.73%. This time may not be so different. This entry was posted in Finance, Wall Street and tagged john stoltzfus, reality, this time is different, VIX. Bookmark the permalink. ← Could America Get Sucked Into a China-Japan Conflict? 1) corporations can borrow interest free money to buying back their own stocks to keep their stock prices high so CEOs Execs and the share holders are making longs of money. 2) They don’t issue new shares so there are little supplies to the market therefore equity price can stay high. I read a story from a Chinese website. There are some raging battles between the Canadian and Chinese big money fighting for good US Real Estate properties. A Chinese rich after merely took some look at some photos he wrote a check bought 35 homes in Florida state. Peter Schift is right about the dollars are coming home jacking up prices everywhere and high inflation in the on the way. Banbernanke said QE targets unemployment rate. If things going so well unemployment will drop fast. What then? The Fed will exit and fast. Then will there be a crush in the stock market before you know it? Yes. The dollars are coming home. Still, I am waiting for a physical shock like a natural disaster, geopolitical crisis or war before inflation really hits. Then when do you think the next market crush? I’m waiting for the sale….. I don’t know, but VIX hitting a new all-time low is a very bad sign. If you buy on the crash, it will be a big crash. Buy stocks that are Global players. These guys will shift from the USA elsewhere if they have to. Their brands are recognised globally. The current anti-corruption movement in China speeds up pushes shocking sum of corruption money (mostly in dollars) out China into the U.S, Canada, and other countries. Xi said China want to get both bad tigers and flies so it’s going to be from top to bottom cleansing. Just watched a Chinese economic show. It’s predicting that luxury goods sale in China will drop as much as 50% from now on. I agree with 1& 2. I also agree that the Chinese are buying investment properties. It is happening in Melbourne Australia too. If you invest a certain amount you get a Visa to live in Australia. It makes good insurance practice if you are “persecuted” in China. I always think derivatives will get in the way of any inflation. Do you mean shadow assets? That is where the big deleveraging is taking place. also I was wondering that shadow banking could be seen as a parallel fractional-reserve system where assets are “printed” rather than money. think of it: collateralization + rehypotecation + securitization -> all together create perception of increased collateral supply, suppressing its price. deleveraging means collateral is removed from the system so its price might surge. I think the truth is that the shadow finance system acted both as liquidity and collateral. The generally deflationary bias since 2008 that has seen trillions added to M0, and M2 increase much faster than GDP tends to suggest it was acting more as liquidity, though. but how much of these increases come from shadow deleveraging and how much from Bennie? Fed actually stifled deleveraging with QEs and other tricks keeping collateral valuation from plunging and re-entered printed monies as collateral too. in some sense he pumped both banking system and shadow system by injecting money where these systems meet. think of these both systems as parallel and separate but blending each other, as if assets were a second currency, like USD in Panama..
hyperinflation arrives when people scrample for stuff, and collapsing shadow banking will scramble for any collateral incluging securitized commodities. what whould happen to shadow banking if he hadn’t stepped in? Probably a much quicker and more brutal deleveraging. That does not mean, though, that he has reinflated it. It is still deflating, just slower. Without Bernanke we would see a much lower level of shadow assets today. But perhaps “deleveraging” is not the right word. Perhaps “liquidation” is the right word! And even if the Fed increased asset purchases 10x, I doubt they could really stop the deleveraging to the point of actual reinflation. The shadow securitisation system was a total self-destructive unsustainable mess. this thing gets interesting when one thinks about (paper) gold gaining status of quality collateral, especially as BASEL III aims to promote it as a first class stuff. if shadow system were seen as a parallel credit system, what metrics/concepts would be equivalent to aggregates like reserves, M0, M1 etc? The only way I have really tried to think about it is that the entire system plus the traditional banking sector is “M4”. The inflation has already happened. Hyper-inflation, a political event, is highly unlikely, as it will destroy the vast majority of all dollar-assets. If the world is seeking dollar assets [stocks, real estate, etc. ], this is not signaling hyper-inflation. There is such an enormous deflationary force going on beneath the surface [over-valued EVERYTHING, especially the bond bubble] that there is no way that printing money will win the day. Look at the Japanese experience as an example. After this round of sub-prime loans is over, there will be another round of defaults, and then people will probably have learned their lesson. Maybe not. And how many Chinese are going to buy real estate in the U.S.? Wasn’t too long ago that the Japanese were buying up U.S. real estate as well. How did that end? Printing money does not work for very long, resulting in either total collapse of the currency, or in this particular case, a total ruination of everybody else’s economy, with the U.S. last-man standing. The U.S. will do whatever needs to be done to insure that as much of this mess as is transferred off-shore as is possible. This is a particular benefit of being the prevailing empire. Americans are what they are because they do what needs to be done to take care of themselves. Just ask the Native Americans, the Mexicans, the English, the French, the Spanish, the Germans, pretty much everybody in Central America, South America, Asia, Africa, and particularly, the Japanese. Honestly, I don’t want to bet against the power of the printing press to destroy the currency. To a great extent, it already has for the vast majority of people. But, an all out hyper-inflation event seem antithetical to the interests of everybody with dollar assets/or those dependent on such, which is most of the wealthy people in the world. I think it could be because this recession/depression was caused by household debt and financial sector debt. Corporate balance sheets and non-financial businesses in general are just fine. If you look at it, corporate profits are just fine. There may be a little bit of overheating in the markets, but I don’t think it’s near bubble territory just yet. Corporations used to own land and buildings, now they lease, so they are not exposed to asset inflations/deflations like they were in the past. Therefore they are not as over leveraged. Maybe the Corporations that buy growth, but not stable businesses that focus on one industry. Corporations are profiting off of unsustainable conditions; essentially free money/ZIRP, massive labor-lay-offs, currency [$] values, sub-prime loans to the sheeple, so on and so forth. All markets are bubble markets. If you had a sound money policy over the past 100 years [particularly since 1971], seems unlikely any of the non-sense going on today would be possible. Are you talking about companies like Google, Apple, and other very successful companies/businesses that employ a lot of people and have helped develop all sorts of useful technologies and revolutionized the way we live our lives? The balance sheets of companies like that are just fine; the problem is that most of the jobs available are in skilled labor. Most companies are having difficulty in finding good employees to hire just like many people are having trouble finding a good job. The problem is that you have people taking out $60,000 in student loans to spend 4 years in college while doing a worthless degree. A large part of the unemployment that we have is structural–the people coming out into the workforce just don’t have the appropriate skill sets and abilities that are needed. I think something like 50% of the businesses have difficulty in finding people to hire. To blame everything on these horrible corporations for being evil seems a little misguided to me. When people are taking out $60,000 in student debt for a job where they don’t need a college degree while getting a useless college degree they deserve a good part of the blame too. It is different this time. Natural Gas reserves in the USA, will see the USA become the new manufacturing powerhouse. It has electricity costs lower than Germany. Nobody appreciates German quality anyway (See China’s growth) so China will lose competitiveness to the USA. I should be a Stock Broker! I am good at sales! Aziz, I tweeted you the below video with text asking – Was Margarete Thatcher a Marxist? – because I thought you preferred free rates of interest, free markets, decentralisation, spontaneous orders and other such natural things, but you never re-tweeted it- i’m not upset so much as I am confused, considering that you also didn’t respond to it to even just me, personally. Then again, no doubt we all have our own priorities, and perhaps you just are too busy with your day to day work to have watched the below. But, if you don’t mind! I must still ask – are ready to accept that the idea of centralised banking systems backed by State monopolies are essentially Marxist configurations, according, at least, to what Marx himself wrote? It would seem to me that this below chat basically runs over everything that is wrong with modern monetary economics. I ask this question. If Basel 3 required Banks to count real estate mortgages in Tier 1 Capital ONLY and I restate ONLY, when the property can be positively geared i.e. the rent return paid on an arms length basis is more than the 10 year bond rate, then would Banks lend the money that they do? Because if they don’t request this, then they are effectively undermining their own Capital Adequacy ratios. Really? I just checked my interactions on Twitter and see nothing from you. Beware of carpel tunnel syndrome! Keeping up with all your followers must be hectic! Are you ready to accept that the idea of centralised banking systems backed by State monopolies are essentially Marxist configurations, according, at least, to what Marx himself wrote? This year, he said, he will focus on smaller events in chalets in the Swiss mountains. “There’s definitely a shift to private, elite events and less public cocktail parties,” he said in a phone interview on Jan. 10. The centralised “public” model of (global?) governance is already disintegrating. People don’t care about nationalism, and those that do can erect their own communities in honour of whatever nation they seek to lavish praise upon. Business interests do not care about national flags. China, America, Africa, No Difference. The perspective is all wrong. You have international debt markets relying on the forced imposition of debt onto non-consenting individuals. You need to personally indicate a willingness to join a contract – normally through some type of signature only you yourself tend to do or have – for that contract to be valid. It mirrors the failure to speak of the electricity in the universe, the ignoring of this blindingly obvious point. As far as new highs – still have some way to climb before reaching inflation adjusted numbers. We can get a near term correction and VIX spike and still keep churning higher. Doesn’t quite seem to be euphoric or hysterical at present, judging by popular sentiment on the street and in the press. I agree that in the long term there are intractable financial problems, but certain measures like unemployment are probably irrelevant to asset prices. We may well be transitioning to a different model wherein large sections of the populace are basically jettisoned from the system, at little cost or harm to the system itself. In any case, a crash is not such a bad thing – it will merely prompt reboot. The hardware itself – that is, the material quantities of physical plant, labor and goods – is in working order.